Hello, again dear Profit.bg readers. How are you today? I hope the business week has been very successful for you, and now you are free to indulge yourselves with some deserved rest in a lovely place away from the responsibilities of the busy city. Well, even if the week has not been that good so far, don't worry, you deserve a break even more. I know last weekend I wrote an article about a guest house in the Rhodope Mountains, but I fell in love with the hotel I am about to present now. 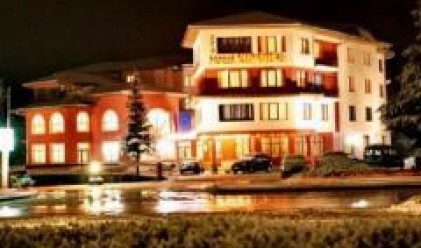 This is the Kiparis Hotel near Smolyan (kiparis is the Bulgarian for Cypress, so I am going to refer to it as the Cypress Hotel). The hotel is one of the Authentic Bulgaria selection, which I am presenting each weekend. A place called Cypress must live up to the name, and I think the hotel has managed to do that. It is situated in the heart of the Rhodope Mountains just 2 km away from the town of Smolyan. I am not going to talk about Smolyan now, I have done that many times. The hotel looks as if it landed on a slope. It comprises several small two or three storey houses cosily attached to each other. It is big enough to accommodate even the largest of companies. Weddings, business seminars, parties, everything can be arranged there. As the buses of Sofia's public transport company – so many people are already in, and yet, there is always room for one more. There are 58 rooms (single, double, or suites). Plus a SPA center, a parking lot and a seminar hall seating 80 people. There is also a lovely three-storey restaurant serving great food in a great atmosphere. I must warn you that the local wine and brandy (rakiya) are so good you should be careful. Enjoy in moderation as they say in advertisements. Especially if you are on the second floor of the restaurant. Seriously the local alcohol is tasty, warming and ...strong. I've seen people trying to leave the restaurant by the freezer door. Apart from the beautiful nature around, there are plenty of things to make your stay pleasant. You can burn toxins in the sauna, or enjoy some time in the SPA center. You can keep fit in the gym, or sip a drink at the bar. Or, you can spend the whole day out. A walk in the forest or a day spent fishing are exactly what comes to my mind when I think of a weekend getaway. Rates? A single room costs 50 leva per night, a double is 70 leva, and those of you who like the “suite life” just need 120 leva for a regular suite or 200 leva for the VIP suite. The price includes a delicious Rhodope breakfast. There are some more pictures below, which you might check out before you start the engine.